Do you want to sleep with me?, designed by Angela Jansen, is based on the observation that some products are no fun to buy. We need them, but get no feeling of reward when we buy them, so they seem like a waste of money. This project makes buying one such product, birth control pills, more rewarding. It turns them into a thing of beauty. And it also allows the man in the relationship to invest in the pills as a gift. kind of a cool idea, not sure if i’d wear it though… what happens when you’re running out? or do you wear the empty ones? Flashbag – USB drive with a built in micropump that indicates how much storage space you have left. Made me smile. After reading about blogger Raed Jarrar’s experience at JFK (he was forced to take off a shirt with Arabic writing on it or miss his flight), I finally stopped being depressed about the war on terror and began being proactively pissed off. 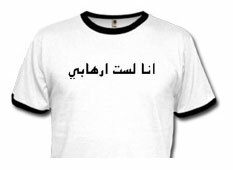 I made this shirt, which says “I am not a terrorist” in Arabic. I plan to wear it every time I go to the airport from now on. In honor of tea company Lipton’s centennial, Japanese design firm Nendo was commissioned to create a cafe inspired by the Mad Hatter’s Tea Party from Alice in Wonderland. The installation was built last month at the Ozone Living Design Center in Shinjuku, Tokyo. Do you eat lunch at your desk? Are you so busy that you have to eat at your desk, the alternative being starvation? Do you prefer to eat at your desk, surfing the Web or getting work done instead of going to a proper lunchroom or eatery and actually—good God –interacting with people?!? If so, the keyboard food tray is for you. Designed by Duck Young Kong, the tray keeps your keyboard clean while providing extra surface space for your food. At least in theory: placing a drink directly above a keyboard seems awfully precarious. Plus, using the keyboard with the tray on top could get awkward. 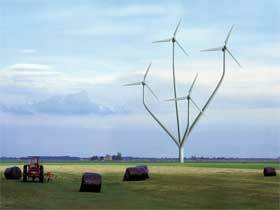 The Dutch advisory for the landscape asked designers to come up with a new generation wind mills. 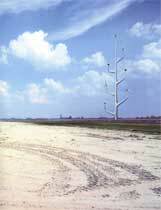 100 MW mountains, a cooperation between One Architecture, Ton Matton and NL architect, suggested that grouping up to 10 turbines into a kind of flower bouquet would add a nice touch to the landscape. Bright’s got photocoverage of the 100% design fair in Rotterdam, Netherlands. Check out the page here. Wanroom and San-X, the Japanese makers of these niftaaay plushie toys are insane. Insanely cute, that is. Each stuffed toy takes on the persona of an everyday household object, with special character names, and a sly little hidden compartment for storage or a mobile phone holder. Whether it’s the cute little sofa, the bed (with slippers) or the bath/shower complete with bubbles you will have a hard time picking just one. In fact, you may “enjoy Wanroom life” so much that you’ll have to get them all. Here’s a great spring project to get you ready for those up-coming summer barbeques: grow your own lawn furniture with the Terra Grass Armchair kit. All you need to do is assemble a cardboard frame, fill it with soil, seed it with grass, then stand back and watch it bloom. In just a couple weeks, a green and grassy armchair will appear in your lawn! This reminds us a bit of the ReadyMade Make-Your-Own-Lawn-Couch project, and Julian Lwin’s Biodegradable Bench that we covered a few days ago. The Terra Grass Armchair however, seems like the simplest and easiest route to a furnished lawn f you don’t have a lot of time or money on your hands.